A cute and compact packaging option for your smallest items, made more stylish by showcasing your custom printed design on both the outside and inside of the box. This exciting packaging option is available in four unique styles using our pre-made die-cut templates - these boxes offer the perfect sizes to package small gift items, products, or party favours for events. Learn more about each of our four unique Mini Box styles below. Turn heads while remaining environmentally friendly with 100% recycled Kraft. Even the simplest designs have major impact on this uniquely natural uncoated range of stocks. Small Rectangular Box - 2.75" x 3.75" x 1.65"
The boxes will be fully assembled by our Production Team, but your design will need to be set up on the flat die-line. Assembled Size: 1.5" x 1.5" x 1.5"
Assembled Size: 2" x 2" x 2"
Assembled Size: 3" x 3" x 3"
Assembled Size: 4" x 8.5" x 1.32"
Assembled Size: 4" x 6" x 3.5"
Assembled Size: 2.75" x 3.75" x 1.65"
Assembled Size: 3.85" x 5.25" x 2.3"
We can also create boxes in custom shapes and sizes. For more information, see: Custom Boxes. We have 4 styles of pre-made box templates available for Mini Boxes: Cube Box (3 sizes), Gift Box, Pillow Box, and Rectangular Box (2 sizes). How are the Mini Boxes assembled? All of the Mini Boxes close with flaps, either on the top or on the side (Pillow Box). Some boxes also use adhesive inside the box to help hold it together. This assembly will be done as part of production, so the Mini Box order will come already partially assembled. It will be folded flat for packaging and shipping purposes, requiring some slight assembly to be done by the customer at home. Can I receive samples of Mini Boxes? You can request samples of Mini Boxes in a Specialty Sample Pack order. Can I order boxes in larger sizes or different shapes? Learn more about Large Boxes. Learn more about Custom Boxes. To request pricing or to order large or custom shaped boxes, please submit a Print Quote request. We can create boxes that are completely custom to your needs in terms of size, shape and material. We also have other pre-made templates for large boxes that you can order by request. The most important aspect of submitting your request for custom boxes will be to supply a die-line file that shows the flat, unassembled guide of what you wish to have produced, in the exact shape and dimensions you will require. The die-line file is necessary before a formal price can be supplied. This will be used to create the custom metal die that will cut the shape of your box out of the cardstock after it is printed, therefore a final die-line file will need to be supplied in vector format. If this is not something you are able to supply, we do have a graphic design team in-house that can take on this project at additional cost. Please mention if you will need us to create the die-line file when submitting your request. 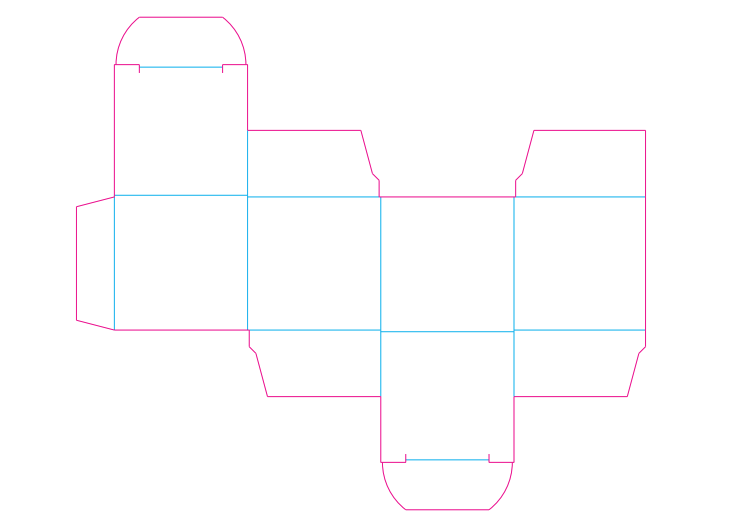 Example of a die-line file indicating cut and score lines (used for our Cube Box product). Different types of box products will require different minimum quantities per order. Digital Output boxes can be ordered in small quantities under 1000, with max quantity dependant on the size of box you are ordering. Offset Output boxes start at a minimum 1000 quantity. Thick Cardboard boxes start at a minimum 500 quantity. Let our Estimations Team know how many boxes you are looking to have produced as well as the unassembled size of your box, and they will be able to recommend to you the most suitable output type. Requests for custom box orders can be submitted through the Print Quote form. 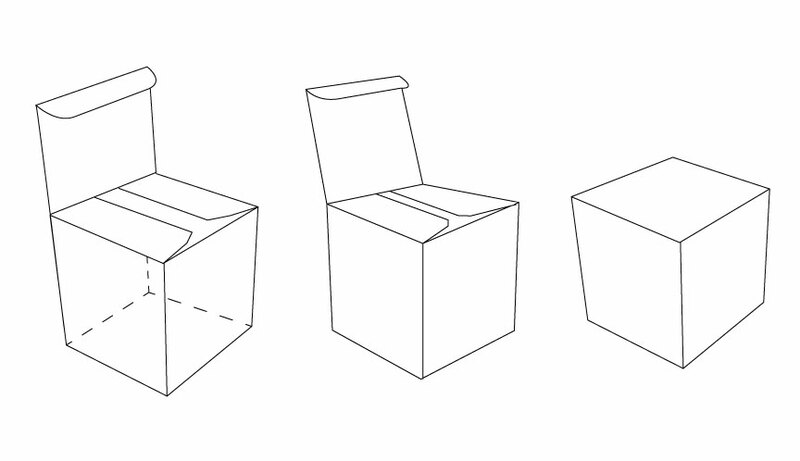 There are many ways we can produce your own custom shape and size of boxes, depending on the stock, size and quantity you are interested in ordering. For this reason, it is best to supply our Estimators with as much information as possible in regards to your needs. This includes letting us know about your intended use for the box, as we have many options available to suit specific needs. Both boxes are available to be produced via Offset Output and a minimum quantity of 1,000. 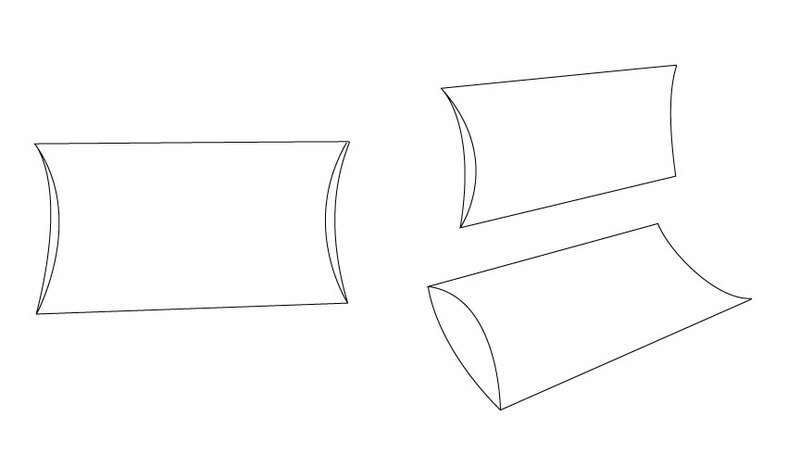 Top Sheet Size - 28.34" x 22.22"
Bottom Sheet Size - 28" x 21.89"
Top Sheet Size - 17.25" x 19.75"
Bottom Sheet Size - 16.75" x 19.31"
We can create boxes in custom shapes and sizes as well. For more information, see: Custom Boxes. We offer two large sizes of pre-made boxes, both of which are two-piece types (lid and base): 8.5" x 11" and 13" x 19". Please note, these boxes are designed to to hold 8.5" x 11" or 13" x 19" prints. The lids are slightly larger to fit over the separate and slightly smaller bottom piece. We offer boxes with many options for size, output type and stock, which will affect the minimum or maximum quantity we would offer. A small quantity order will likely need to be produced Digital Output (less than 1000), while larger quantity orders will need to be produced Offset Output. All box order requests are reviewed by a print specialist who will be able to supply this information based on your other requirements, or can give you box options based on the quantity that you need produced. We can produce boxes in a wide variety of sizes from small to large. The size will be restricted by the stock and print output used. Smaller sized boxes up to 13" x 19" flat will have more options for stock. The larger your box size is, the fewer stock options we will have available. Can you design a custom box for me? We have an in-house Design Department that specializes in design for custom print projects. The price of a box die-line design will depend on the complexity of the shape required and will be quoted to you by a designer based on your individual needs. When submitting your Print Quote request you will need to mention that you will also require a Design Service. What closure styles are there for boxes? 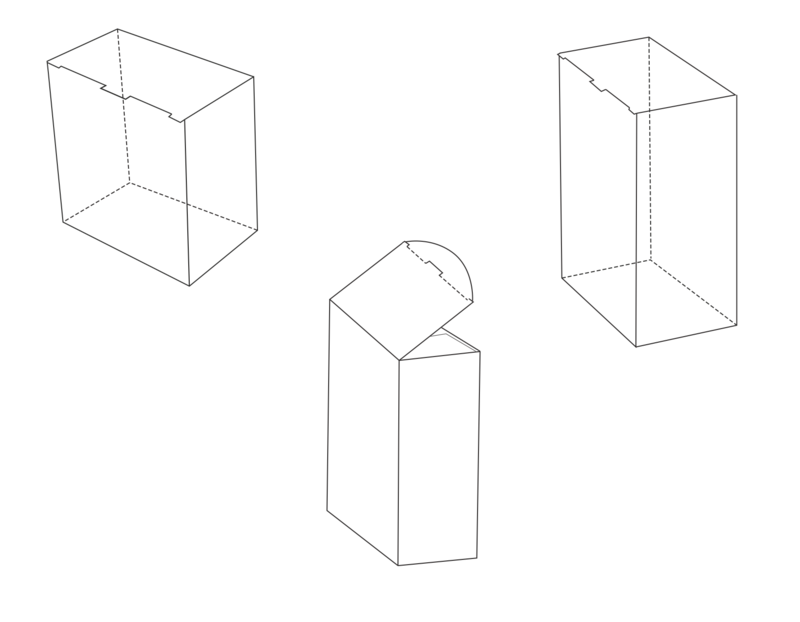 There are three main styles for the closure of box products: Fitted slits (die-cut), a separate larger lid piece to bottom piece, or mounted velcro. If you are looking for a different style of box closure let us know - we are able to accommodate most custom requests. What stocks are available for boxes? We have a wide variety of stock options available, however these are limited to the unassembled (flat sheet) size of your box shape, as well as the output type. Typically a 10pt cardstock is the thinnest we recommend for box products. Digital Output orders can use cardstock up to 20pt thick, with some coating restrictions. If you are interested in a thicker option, you can request cardboard to be used. We also offer a Mega Thick 24pt Uncoated stock. The turnaround time for a box product will vary depending on the specific product, output type, quantity and any specialty add-ons. The fastest regular turnaround time will be for small quantity Digital Output orders using one of our pre-made Small Box templates - this will be a 3-5 business day estimated timeline for production. Offset Output products will have a production time of 10+ business days. Other details that can extend the turnaround time will be very large quantities, Digital Output orders that require a sheet size larger than 13" x 19", the creation of a custom shaped box, or speciality add-ons like foil. Our Estimators will include a turnaround time estimate with the quote for your request product. Rush options may be available, so if you have a critical deadline for your box order, please indicate this within your Print Quote request. Are your boxes FDA approved? How do I order boxes? Boxes can only be ordered through a Print Quote request. This will assign one of our print specialists to your request who can help make sure your order is for the right selections of stock and output type for your needs. 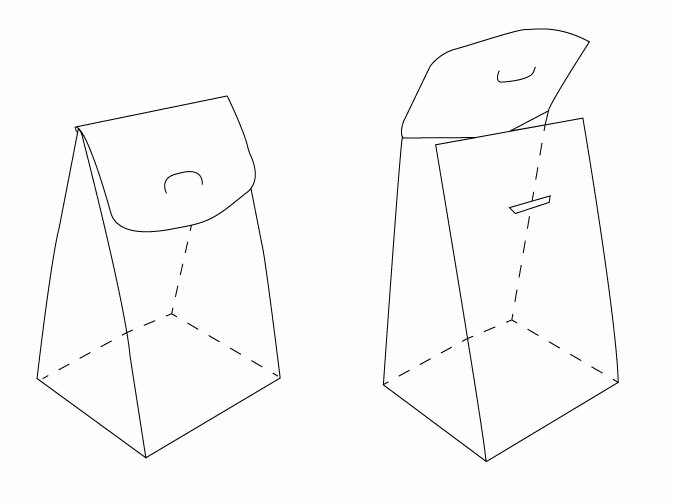 If you are looking for a custom shaped box please include a die-line file with your request. Is there a minimum or maximum quantity for this product? Small Rectangular Box - 2.75" x 3.75" x 1.65"Medium Rectangular Box - 3.85" x 5.25" x 2.3"Pillow Box - 8.5" x 4" x 1.25"Mini Cube Box - 3" x 3" x 3"Mini Cube Box - 2" x 2" x 2"Mini Cube Box - 1.5" x 1.5" x 1.5"
If you do not have your own design software or are not able to create a design, our in house Design Department will be happy to take on your project. Additional costs will apply for design work and will be quoted to you by one of our experienced designers based on your request. You can request Design Services here. Printing can be full bleed on both sides (outside and inside the final assembled box). On uncoated stocks, you may see some slight cracking of the ink along the scored edges of the box. Slight shifting will occur during the printing, die-cutting and scoring processes, which means your artwork may shift slightly in any direction. For this reason, we do not recommend trying to register printed artwork to line up perfectly with the fold lines, as we can't guarantee this type of registration. Some of the box styles are very small, but the design should still meet our recommendations for digital output printing. Line weights are recommended at 0.5pt or thicker. Font sizes are recommended at 6pt or more, but this can vary depending on the line weights used in the font style you choose. There are also design considerations to note for each of the paper types available for this product. Learn more about designing for Silk Matte Laminate and Brown Kraft.